On a fall day in 2015 at Sunnybrook hospital in Toronto, a dozen people huddled in a small room peering at a computer screen. They were watching brain scans of a woman named Bonny Hall, who lay inside an MRI machine just a few feet away. Earlier that day, Hall, who had been battling a brain tumor for eight years, had received a dose of the chemotherapy drug doxorubicin. She was then fitted with an oversized, bowl-shape helmet housing more than 1,000 transducers that delivered ultrasound pulses focused on nine precise points inside her brain. Just before each pulse, her doctors injected microscopic air bubbles into a vein in her hand. Their hope was that the microbubbles would travel to the capillaries of the brain and, when struck by the sound waves, oscillate. This would cause the blood vessels near Hall’s tumor to expand and contract, creating gaps that would allow the chemotherapy drug to escape from the bloodstream and seep into the neural tissue. Finally, she received an injection of a contrast medium, a rare-earth metal called gadolinium that lights up on MRI scans. 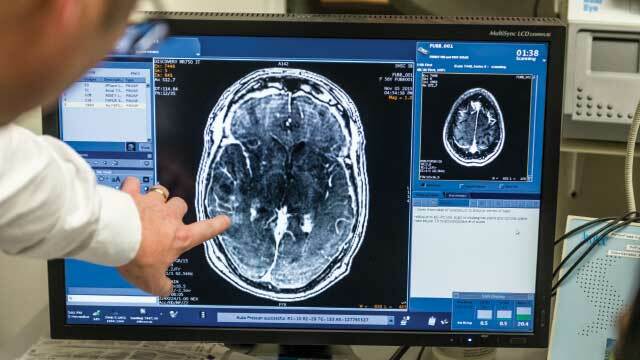 Now, doctors, technicians, and reporters crowded around to glimpse a series of bright spots where the gadolinium had leaked into the targeted areas, confirming the first noninvasive opening of a human’s blood-brain barrier (BBB). “It was very exciting,” says radiology researcher Nathan McDannold, who directs the Therapeutic Ultrasound Lab at Brigham and Women’s Hospital in Boston and helped develop the technique that uses microbubbles and ultrasound to gently disturb blood vessels. Doctors typically depend on the circulatory system to carry a drug from the gut or an injection site to diseased areas of the body, but when it comes to the brain and central nervous system (CNS), the vasculature switches from delivery route to security system. The blood vessels of the CNS are unlike those throughout the rest of the body. Their basic units—endothelial cells—are endowed with a suite of unique properties that prevent passage of more than 90 percent of small-molecule drugs and nearly all biologics through or between the cells. Certain proteins seal spaces between cells, for example, and molecular pumps oust unwanted molecules that make their way into the endothelial cells before those substances have a chance to migrate through the blood-vessel cells and into the CNS. More security lies just outside the vasculature. As is the case for most blood vessels throughout the body, the endothelial cells are surrounded by a layer of extracellular matrix proteins and supported by cells called pericytes, which control blood vessel development. But in the CNS, the density of pericytes is nearly 100 times higher than elsewhere in the body. CNS endothelial cells are further covered by the pseudopods, or false feet, of neural cells called astrocytes. Both pericytes and astrocytes provide an extra barrier and influence the expression of genes, such as those encoding components of tight junctions, that make CNS blood vessels so selective. That day at Sunnybrook hospital, however, the focused ultrasound technique proved successful in breaching this formidable barrier. “We worked on this for 15 years doing animal studies, and we’re at the point where it’s ready to go to the clinic,” says McDannold. Although Hall’s procedure was a milestone, and could pave the way for targeted, noninvasive drug delivery to the brain, it was hardly the first time the BBB had been opened for a medical purpose. For decades, physicians have used hyperosmotic solutions that cause endothelial cells to shrink throughout the brain-adjacent vasculature, opening gaps that allow drugs to pass through. Procedures that bypass the BBB by directly injecting a drug into brain tissue or into cerebral-spinal fluid (CSF) using catheters have also been in use since the 1990s. 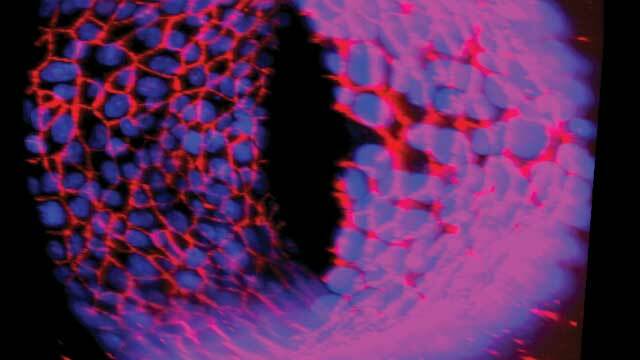 But researchers such as McDannold are looking for less invasive and more-precise ways to get in. Some want to open the BBB at specific locations and defined times to treat conditions such as brain tumors; others aim to leave it intact while delivering daily treatments for diseases such as Alzheimer’s. To achieve these goals, researchers are developing a diverse set of strategies, each designed to circumvent or exploit the unique features that give the BBB its strength and selectivity. To design ways to breach the BBB, researchers first have to understand it. Biomedical engineer Peter Searson has spent decades meticulously acquiring the necessary technologies and methodologies to reverse-engineer a three-dimensional facsimile of the human BBB, complete with fluid flow to represent the shear force supplied by blood. He and his team at Johns Hopkins University have gradually increased their model’s complexity, first deriving the required cell types from human induced pluripotent stem cells, then determining the most appropriate cell culture conditions to achieve the desired phenotypes. In 2015, for example, they finally worked out a way to culture human astrocytes in a 3-D gel matrix without activating the cells’ stress response, which would alter the expression of certain genes in the astrocytes and other BBB cell types.1 The next step is to culture stress-free astrocytes and pericytes together. “We’re just about at the point now where we can start combining everything we’ve learned,” Searson says. Still, he doesn’t think this complex model will be complete for at least another decade or two. That’s because the BBB is more than just a couple of extra layers around blood vessels. One of the most prominent of those properties is the presence of tight junctions, protein structures that button up the membranes of neighboring endothelial cells near their blood-facing, or luminal, ends. In most areas of the body, nutrients reach organs by slipping between blood vessel endothelial cells. Tight junctions in the brain vasculature restrict the flow of molecules from the blood to the CNS. “Even water molecules can’t make it through these cracks,” says Ronald Cannon, a molecular biologist at the National Cancer Institute. A FORMIDABLE BARRIER: The blood-brain barrier (BBB) is a collection of specialized cells and proteins that control the movement of molecules from the blood to the central nervous system (CNS). The blood vessel endothelial cells of the BBB are cemented together by protein structures called tight junctions (1), preventing diffusion of most molecules between cells. BBB endothelial cells display transporters (2), receptors (3), and channels (4) that facilitate selective transport of vital nutrients into the CNS. They also possess efflux pumps, such as P-glycoprotein, that expel most small, amphiphilic molecules that are soluble in the blood and in cell lipid membranes (5). 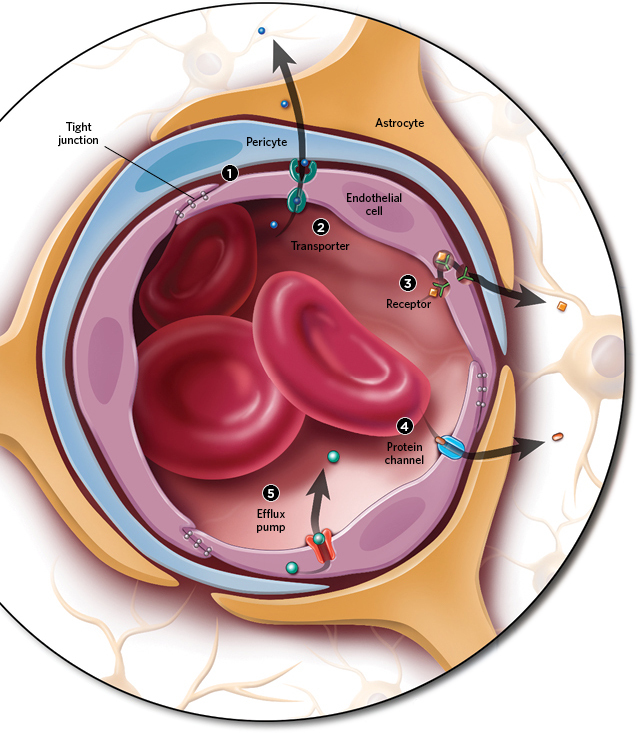 Pericytes and astrocyte pseudopods serve as an additional physical barrier between the blood vessel and brain tissue, and support the expression of endothelial cell genes required to maintain the BBB. 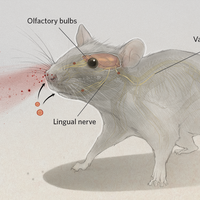 Since then, both McDannold and Hynynen have continued to refine the procedure in animal models and to detail its mechanisms. In a study published last year, McDannold’s team used focused ultrasound combined with microbubbles to deliver anti-HER2 antibodies to the brains of 10 rats with breast cancer tumors that had metastasized to the organ.4 The antibody slowed brain tumor growth in four of the rats that received the ultrasound treatment. “We didn’t see [slowed growth] at all without the ultrasound,” says McDannold. BBB MODELS: A goal of the field is to recapitulate the blood-brain barrier (BBB) in vitro to better study its properties and ways to get past it. In one approach, researchers have formed blood vessels from stem cell-derived brain microvascular endothelial cells (above: tight junctions, red; nuclei, blue). Meanwhile, other scientists are creating spheroids (below) that mimic some of the BBB’s structure and function. In the leftmost spheroid pictured here, efflux pumps (green) actively send molecules back out to the environment. In the middle and far-right spheroids, tight junctions (green) prevent macromolecules from entering in the first place. (Nuclei, blue; endothelial cells, red)IMAGE TAKEN BY MORIAH KATT IMAGE COURTESY OF CHOI-FONG CHO; REPRINTED WITH PERMISSION FROM NAT COMMUN, 8:15623, 2017. The technique is also being tested in humans. 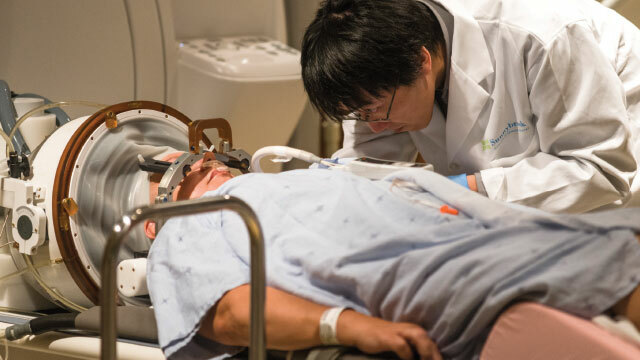 In addition to a Phase 1 brain cancer trial using Bonny Hall’s treatment that began in 2015, this year researchers at Sunnybrook began testing the safety of using focused ultrasound to open the BBB in the frontal lobes of patients with Alzheimer’s disease. And McDannold is working toward getting US Food and Drug Administration (FDA) approval for human trials in the U.S. Researchers have spent decades meticulously acquiring the necessary tech­nologies and methodologies to reverse-engineer a three-dimensional facsimile of the human BBB. Companies rely on screening drugs in vitro, often using a canine kidney cell line because, like the BBB, kidney cells express tight junctions. Researchers can also obtain endothelial cells from human brain tissue removed during surgery, but when cultured alone, these cells quickly lose their identity and stop expressing tight junctions. Recognizing a need for a simple and accurate screening platform, Cho and her colleagues have developed a spheroid model that allows mouse endothelial cells, pericytes, and astrocytes to interact in a 3-D matrix, preventing the endothelial cells from losing their identity. The cells tend to self-assemble so that the astrocytes are in the center of each sphere, with pericytes on the outside and endothelial cells in between.7 Although the layering is different from what is seen in vivo, the spheroids faithfully recapitulate some BBB functions. Cho’s team showed that while the spheroids let carbon dioxide, oxygen, and alcohol into their centers, they exclude a sugar molecule called dextran, just as would be expected by the BBB. In a study published in April, Cannon and his colleagues reported that they could temporarily inhibit P-gp’s activity.8 Using capillaries cut out of rat brains, they tested agents for their ability to increase or decrease P-gp’s activity, and found that a phospholipid called lysophosphatidic acid (LPA) and the antidepressant amitriptyline can together reduce the ability of P-gp to pump a fluorescent substrate into the capillaries’ interior. The effect occurred within minutes of exposure to the drugs, and disappeared almost as fast once the drugs were removed. “That reversibility is important,” says Cannon, so that the BBB can resume its normal function after allowing the drug into the brain. Cannon’s team tested both LPA and amitriptyline on brain capillaries from a rat model of amyotrophic lateral sclerosis (ALS), in which P-gp expression is increased, and found that injecting the drugs into the animals’ carotid arteries increased the amount of substrate that made it across the BBB and into the brain, indicating that the treatment reduced the pump’s activity. Cannon says he hopes others could make use of the properties of these compounds to revisit drugs that cross the BBB but have been shelved because they get immediately removed from the brain by P-gp. 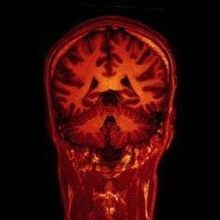 Used clinically, drugs that interrupt efflux pump activity could be helpful in getting drugs into the brain without the risks of disturbing the integrity of the BBB. BYPASSING THE BBB: Designing drugs to reach the CNS requires some creativity on the part of researchers. The approaches vary from disrupting the BBB’s tight junctions with ultrasound waves and microbubbles to hijacking the barrier’s own transport systems. Each technique comes with its benefits and drawbacks, making it appropriate for some patients or drug types but not others. Many of the BBB’s specialized features are not designed to keep molecules out, but to bring them into the CNS. The brain needs sugar, certain amino acids, and electrolytes, says Cannon, “and we have transport systems set up for that.” Specifically, BBB endothelial cells have channels, protein transporters, and receptors that chaperone nutrients right through endothelial cells, all of which allow the passage of vital molecules such as ions, sugars, and amino acids into the CNS. In some instances, a therapy may be a natural substrate of one of these transporters—that’s the case for the Parkinson’s drug L-dopa, an amino acid that uses the large neutral amino acid transporter type 1 to get into the brain, where it is converted into dopamine. But in theory, researchers could dress up any drug to be recognized by a transporter or receptor to trick the brain into taking it up. For example, it’s possible to decorate nanoparticle-based drugs with a transporter’s natural substrate. A company in the Netherlands called 2-BBB Medicines developed a technique that incorporates the antioxidant glutathione into a liposome membrane, allowing the liposome and its drug cargo to be taken into endothelial cells through a glutathione transporter. Using these glutathione-spiked liposomes to encase doxorubicin, the researchers got nearly five times more of the chemotherapeutic drug into the brains of treated rats9 and the technique limited brain tumor growth in mice.10 The company is now testing the liposomes in people with brain tumors and as a means to deliver a steroid across the BBB of people with multiple sclerosis and other inflammatory CNS diseases. In a study published in 2013, his group demonstrated that in mice with brain tumors SNAs crossed the BBB and accumulated in the cancerous tissue, where they delivered siRNAs to knock down expression of the oncogene Bcl2L12.12 Now, a mere four years later, clinical researchers at Northwestern are teaming up with the National Cancer Institute to test this approach in people with glioblastoma. Back in the lab, Mirkin’s team found that cell cultures of astrocytes internalize SNAs using a group of receptors called scavenger receptors that bind to a variety of ligands with repetitive patterns, but he says they haven’t uncovered the precise route that the particles take through the BBB. 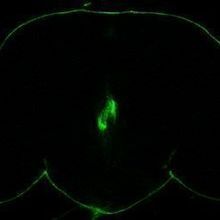 The 2009 study spurred numerous other researchers to begin using AAVs to traverse the BBB, and Kaspar, in addition to his position at Ohio State, now serves as the chief scientific officer of AveXis, a company that launched in 2010 to develop the use of AAV9 to deliver the SMN gene to the motor neurons of children with spinal muscular atrophy type 1. Earlier this year, AveXis released the results of an ongoing Phase 1 trial, which showed that most of the 15 children in the trial are reaching motor milestones—such as sitting unassisted—that patients with spinal muscular atrophy type 1 usually don’t reach. Other groups are making use of immune cells that naturally traverse the BBB during inflammation. 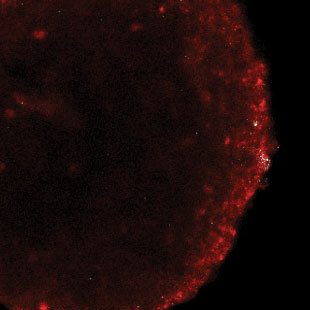 For example, a team of researchers from MIT and the University of North Carolina at Chapel Hill recently constructed nucleus-size polymer “backpacks,” which they attached via antibodies to mouse macrophages before injecting the cells into the bloodstreams of mice with brain inflammation.16 The macrophages were attracted to the inflammatory environment in the brain and brought along the backpacks. The researchers also described proof-of-concept studies in cell cultures that showed that the backpacks could be constructed to carry and release an antioxidant enzyme, suggesting the approach could potentially be used to deliver protein therapeutics to the brain. TESTING THE SPHEROID: High levels of a BBB-penetrating molecule (red) enter the spheroid, while a non-penetrating molecule (white) remains mostly outside the spheres. IMAGE BY CHOI-FONG CHOIn many cases, researchers trying to deliver drugs to the brain face an intact BBB, but sometimes the very condition being treated has already compromised the barrier. 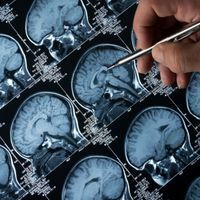 “Over the last 10 years or so, it’s become apparent that almost every disease of the CNS is associated with disruption or dysfunction of the BBB,” says Peter Searson of Johns Hopkins University. The extent to which BBB leakiness in disease helps drugs get into the brain is variable and debatable, but it has already opened doors to potential ways to disrupt the barrier on purpose. In July, for example, an international team of researchers published a study on a type of antibody, isolated from the cerebrospinal fluid of patients with an optic nerve inflammatory disease, that made cultured BBB endothelial cells more permeable to the sugar dextran. In mice receiving injections of the antibody, proteins that are normally sequestered to the blood ended up in brain tissue, suggesting that such antibodies could aid in drug delivery to the CNS. (Sci Transl Med, 9:eaai9111, 2017). Searson says his ultimate goal is to build BBB models using induced pluripotent cells from diseased individuals to understand how various neurological conditions compromise the barrier and how it might be repaired. Each day, that goal gets closer as researchers understand more about the intricacies that define the BBB—intricacies that Searson’s team is striving to mimic in cell culture. It’s a challenge, but he is not giving up anytime soon. “It’s what I like to tell my students: if it was easy, someone else would have already done it,” he says. Amanda B. Keener is a freelance science writing living in Denver, Colorado. A.L. Placone et al., “Human astrocytes develop physiological morphology and remain quiescent in a novel 3D matrix,” Biomaterials, 42:134-43, 2015. N. Sheikov et al., “Effect of focused ultrasound applied with an ultrasound contrast agent on the tight junctional integrity of the brain microvascular endothelium,” Ultrasound Med Biol, 34:1093-104, 2008. K. Hynynen et al., “Noninvasive MR imaging-guided focal opening of the blood-brain barrier in rabbits,” Radiology, 220:640-46, 2001. T. Kobus et al., “Growth inhibition in a brain metastasis model by antibody delivery using focused ultrasound-mediated blood-brain barrier disruption,” J Control Release, 238:281-88, 2016. A. Burgess et al., “Alzheimer disease in a mouse model: MR imaging-guided focused ultrasound targeted to the hippocampus opens the blood-brain barrier and improves pathologic abnormalities and behavior,” Radiology, 273:736-45, 2014. J.F. Jordão et al., “Amyloid-β plaque reduction, endogenous antibody delivery and glial activation by brain-targeted, transcranial focused ultrasound,” Exp Neurol, 248:16-29, 2013. C.-F. Cho et al., “Blood-brain-barrier spheroids as an in vitro screening platform for brain-penetrating agents,” Nat Commun, doi:10.1038/ncomms15623, 2017. D.B. Banks et al., “Lysophosphatidic acid and amitriptyline signal through LPA1R to reduce P-glycoprotein transport at the blood–brain barrier,” J Cereb Blood Flow Metab, 1:271678X17705786, 2017. 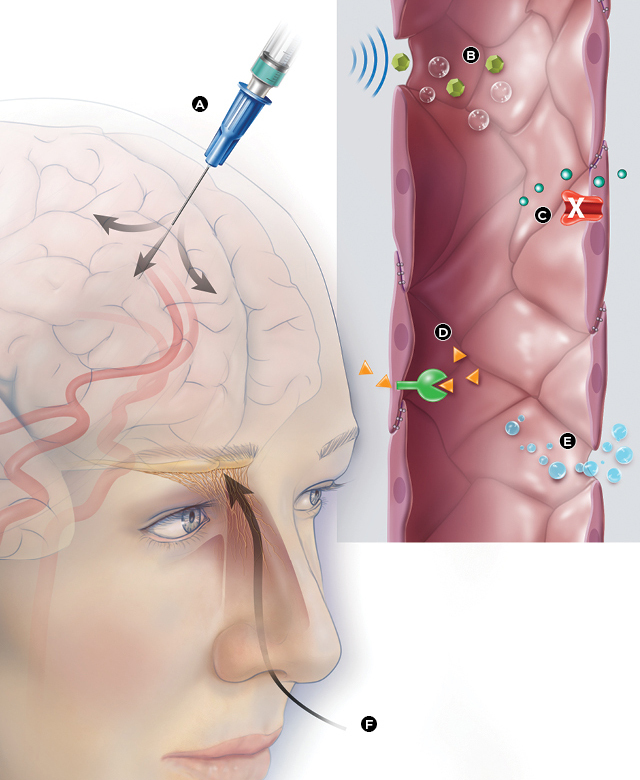 T. Birngruber et al., “Enhanced doxorubicin delivery to the brain administered through glutathione PEGylated liposomal doxorubicin (2B3-101) as compared with generic Caelyx,/Doxil—A cerebral open flow microperfusion pilot study,” J Pharm Sci, 103:1945-48, 2014. P.J. Gaillard et al., “Pharmacokinetics, brain delivery, and efficacy in brain tumor-bearing mice of glutathione pegylated liposomal doxorubicin (2B3-101),” PLOS ONE, 9:e82331, 2014. Y.J. Yu et al., “Therapeutic bispecific antibodies cross the blood-brain barrier in nonhuman primates,” Sci Transl Med, 6:261ra154, 2014. S.A. Jensen et al., “Spherical nucleic acid nanoparticle conjugates as an RNAi-based therapy for glioblastoma,” Sci Transl Med, 5:209ra152, 2013. K.D. Foust et al., “Intravascular AAV9 preferentially targets neonatal neurons and adult astrocytes,” Nat Biotechnol, 27:59-65, 2009. S.F. Merkel et al., “Trafficking of adeno-associated virus vectors across a model of the blood-brain barrier; a comparative study of transcytosis and transduction using primary human brain endothelial cells,” J Neurochem, 140:216-30, 2017. B.E. Deverman et al., “Cre-dependent selection yields AAV variants for widespread gene transfer to the adult brain,” Nat Biotechnol, 34:204-09, 2016. N.L. Klyachko et al., “Macrophages with cellular backpacks for targeted drug delivery to the brain,” Biomaterials, 140:79-87, 2017.